With most of the stream flows closer to Denver still running high in early August, I had my eye on the Taylor River. We made plans to go to a Rapids soccer match on Friday night so we decided to gamble we could find a campsite on Saturday, always an iffy proposition. We got up nice and early and packed everything in the Santa Fe in record time and departed at 8:05AM. 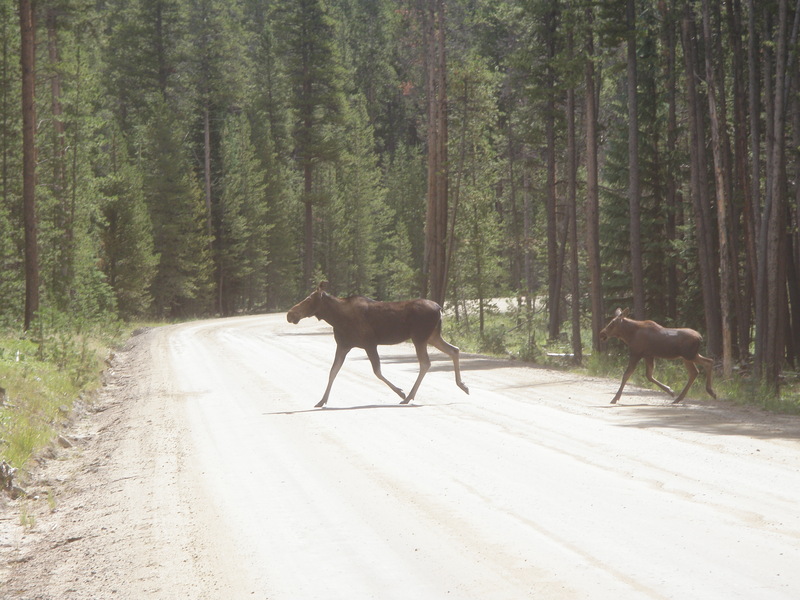 The drive to Taylor Park was 3.5 hours and we arrived at the campground near the bottom of Cottonwood Pass at 11:30. 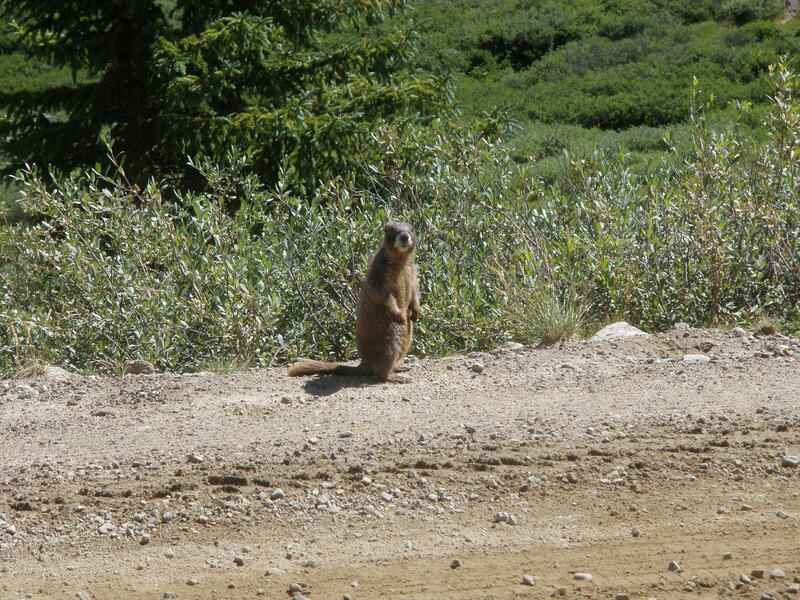 On the western side of Cottonwood Pass we spotted a marmot and two moose. When we arrived at Dinner Station campground we immediately noticed the campground host and asked him if there were any open sites. He told us 13 was open for one night, so we found it along the river with a few decent shade trees and laid claim. 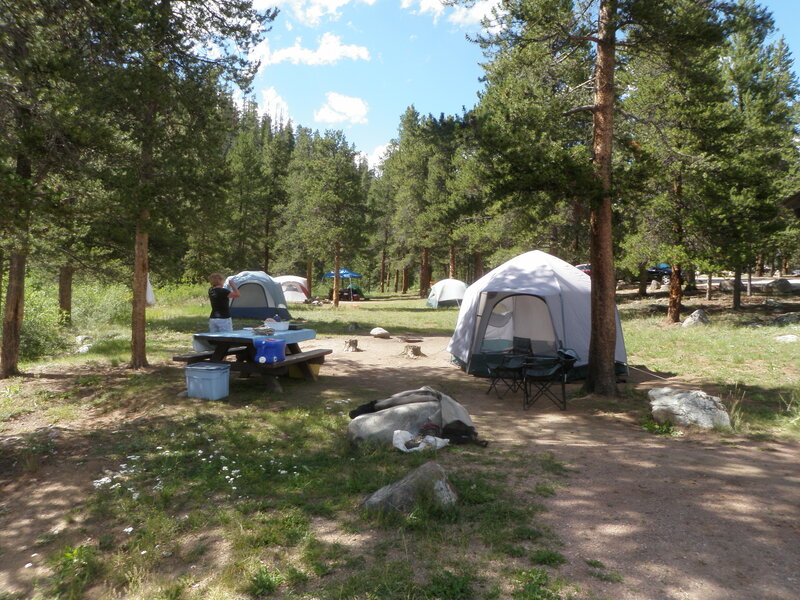 It was great to find a nice campsite at 11:30 on Saturday morning on the first weekend in August. We unpacked the food bins and had some lunch, and I wanted to get some fishing in before it got too hot, so Jane accompanied me as we drove back down the dirt road a mile or so and parked in a makeshift lot. There was a tractor with a camper trailer already there, but they never bothered us. 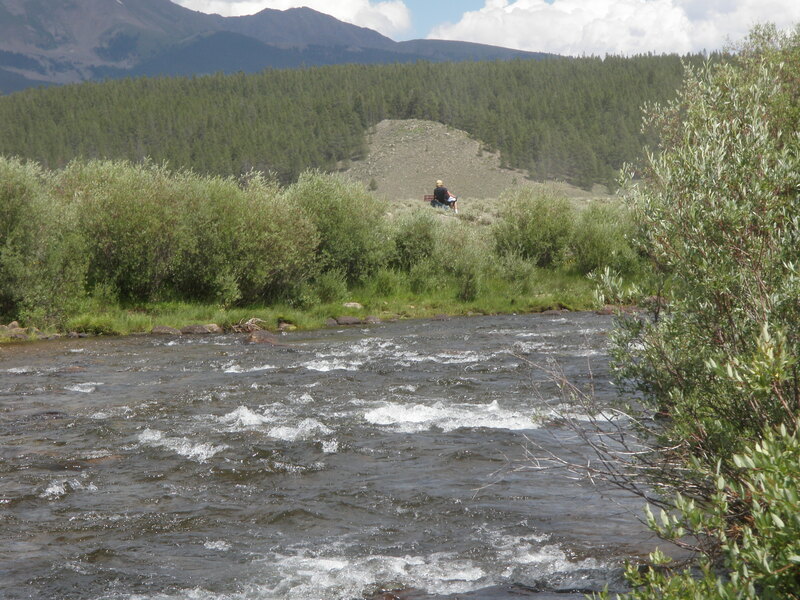 Jane took her chair and Kindle and set up along the river while I commenced fishing. I tied on a yellow Letort hopper and fished it without a dropper initially. I covered some attractive water and didn’t have any action, so I added a beadhead pheasant tail dropper. 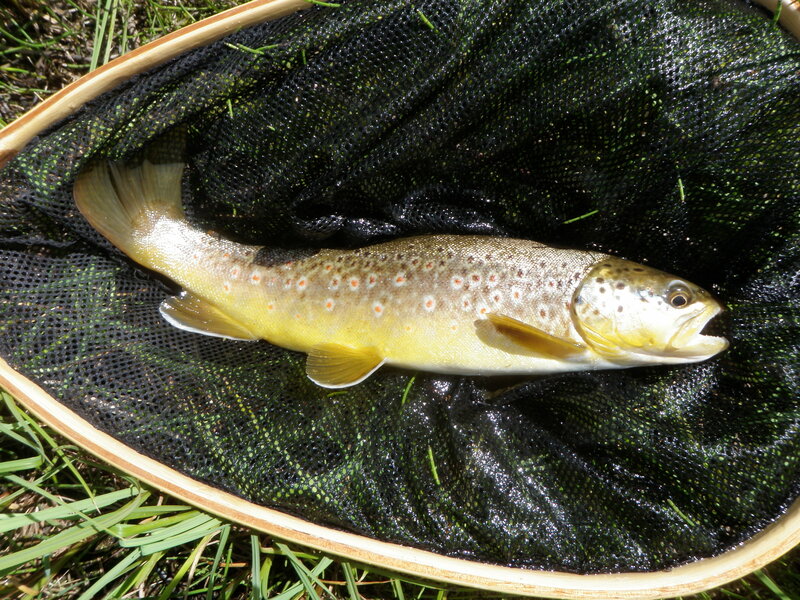 The combination began to produce and I landed 12 fish before 3PM when I quit for the day. Roughly half the fish took the BHPT and the other half rose to the hopper. I actually landed over 20 fish but many were too small to count. At three I walked back to the car as Jane was carrying her chair back. We returned to the campsite and set up the tent and had some beverages and hors d’oevres and eventually ate a Mediterranean dinner of pita bread, falafels, chopped onions, tomatoes, lettuce and a yogurt based sauce. Before dinner Jane got the idea that if I caught a couple trout, we could grill them and add them to the pita. I put on my waders and fished in the river near our campsite for an hour or so and had two hookups, but didn’t land any fish. There were quite a few caddis bouncing around, but my caddis imitations drew no interest. Eventually I went to a pair of caddis pupa with a strike indicator, and I managed one hookup on this combination, but did not land a fish. When I needed fish the most, I couldn’t deliver.